BUILDING OUR COMMUNITIES The Manzano High School (MHS) Athletics Complex project directly coincides with Manzano’s mission to be dedicated to an inclusive, college-bound and career ready culture. 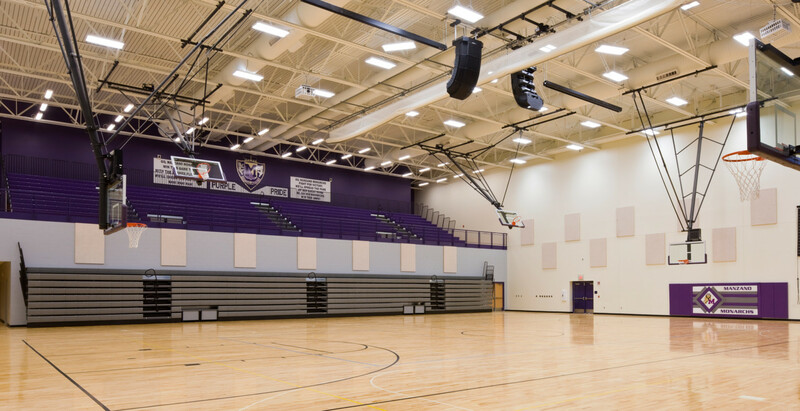 this project provides MHS with a new gym for the first time in almost 60 years. The facility includes an approximately 103,000 square foot, 2-story athletic complex including: main gymnasium, auxiliary gymnasium, girls PE locker room, girls team locker room, boys PE locker room, boys team locker room, cheer room, wrestling room, training/whirlpool room, weight room dance/studio room, large classroom (dividable into two teaching spaces), coaches offices, concession area, and lobby.